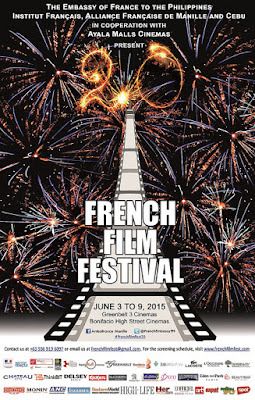 The French Film Festival will be running from June 3 to 9, 2015 at the Greenbelt 3 cinemas in Makati City and at the Bonifacio High Street cinemas in Taguig. Similar to last year, tickets for each screening are priced at P100.00 to cover the operational costs of the cinema. Tickets are available at the box office or through www.sureseats.com. “In the past three years, many high-level exchanges between our two countries have taken place, but the results of these exchanges aren’t limited to the political and policy sphere,” French Ambassador Gilles Garachon said. The appeal of the festival lies in the discovery among local viewers that they have more in common with the French despite the initial geographic, historical, and cultural distance between France and the Philippines. For this edition’s line-up, 19 recent releases contain themes that local audiences can easily identify with, including family, love, conflict, passion, and the arts. To commemorate the two decade run of the French Film Festival, two films will be screened at the red carpet opening night on June 3 at Greenbelt 5. The opening French film, La Famille Bélier (The Bélier Family), tells the story of a provincial deaf-mute family that must deal with the desire of their daughter to study music in Paris. On the same night, Taklub,Brillante Mendoza’s latest film and the only Philippine entry to the Un Certain Regard section of the 2015 Cannes Film Festival, will be premiering at the festival’s red carpet opening night. Produced by Sen. Loren Legarda with the support of the Department of Environment and Natural Resources and the Philippine Information Agency, Taklub follows the lives of the survivors of Typhoon Yolanda and contains themes on disaster risk reduction and climate change. The film comes at a very crucial period before 195 countries come together this December in Paris for the 21st Conference of the Parties to the United Nations Framework Convention on Climate Change (COP 21) to conclude an ambitious, universal, and legally binding agreement to limit greenhouse gas emissions. Climate change was a major focus of the state visit of French President François Hollande last February, where he launched, together with President Aquino, the Manila Call to Action on Climate Change. He also visited Guiuan, Eastern Samar, with French actresses Marion Cotillard and Mélanie Laurent. 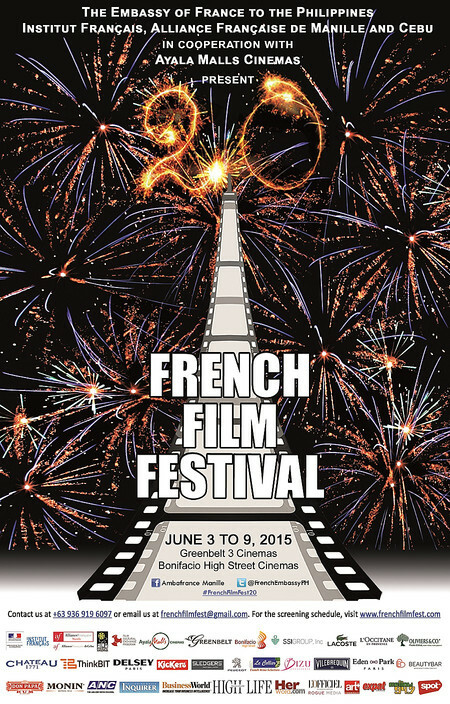 The French Film Festival, however, is not only about promoting French cinema in the Philippines. For years, the French government, through its embassy, has assisted local filmmakers in bringing their films to France and has supported initiatives to preserve Philippine film heritage. Pepe Diokno, with his film Above the Clouds, is the first recipient of the World Cinema Fund granted by the France’s Ministry of Culture and Communication, Ministry of Foreign Affairs and International Development, and Institut Français. This fund seeks to provide funding for joint French and Filipino co-productions. Moreover, the Centre National du Cinéma et de l’Image Animée (CNC) signed a cooperation agreement with the Film Development Council of the Philippines (FDCP) to facilitate the establishment of a National Film Archives for the conservation of Philippine film heritage. In addition to the film screenings, this year’s festival goes beyond cinema with a concert on June 5, 8:00pm at the Greenbelt 3 Park. French DJ Oof will be fusing electro and cinema with the Cinémix project. Cinémix is a collection of reinterpretations of French soundtracks from the 1960s and 1970s synced to videos flashed onscreen. Entrance is free of charge. This year’s festival ends with glamour and style with a fashion night hosted by L’Officiel Manila and the SSI Group, Inc. at the Central Square, Bonifacio High Street on June 9. Capturing the essence of France as one of the world’s fashion capitals, guests would be able to enjoy special shopping perks and discounts offered by the various brands housed by Central Square. The 20th French Film Festival is organized by the Embassy of France to the Philippines, Institut Français, the Alliance française de Manille and Cebu, in cooperation with the Ayala Malls Cinemas, Bonifacio High Street and Greenbelt. This event would have not been possible without the support of the platinum sponsors: SSI Group, Inc., Beauty Bar, Eden Park, Lacoste, L’Occitane, Oliviers & Co., and Vilebrequin; gold sponsors ThinkBIT and Chateau; bronze sponsors Delsey, Kickers, Sledgers, Peugeot, Bizu, Le Cellier, Don Papa, Monin and TWG; and media partners ANC, the Philippine Daily Inquirer, BusinessWorld, High Life, HerWord.com, L’Officiel Manila and Rogue Media, Art Plus Magazine, Expat News, Mellow 94.7 Sounds Good, and Spot.ph.